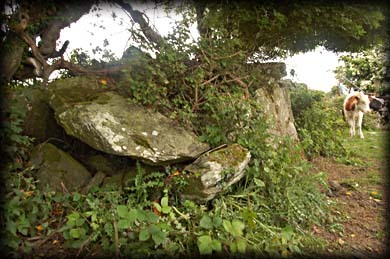 It is quite difficult to spot this tomb as it is now part of a field wall and covered in brambles. At first sight this wedge tomb looks quite disappointing, but on closer inspection you can see that the gallery is in excellent condition. The front of the gallery faces west and is covered by four roof stones that are sloping down from the west to the east, giving a distinctive wedge shape. There are slight traces of outer walling but the main feature is the gallery. Within a short period after arriving we were completely surrounded by a herd of calves curious to know what the hell we were looking at. Situated: From Drogheda take the take the N1 north, just before you reach the motorway there is a left turn for Monasterboise, take this turn and go through the roundabout, then head straight for Tinure. Then at Tinure crossroads take a right then an immediate right down the old bog road. About 1 kilometre down this road you will come to a cottage on your left with a small lay-by, opposite this is a large farm gate. Follow the track to your right then left into a long field. follow the field wall around. 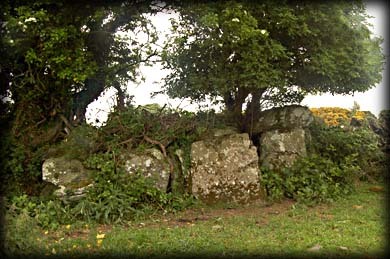 The tomb is at the far end next to a gate. Discovery Map 36: O 0489 8308. Last visit Apr 2007.